Lieutenant-Colonel Elliot Horsford, who has died aged 94, was awarded an MC in Burma in 1945. In February 1945, Horsford was in command of a company of 3rd Battalion 8th Gurkha Rifles (3/8 GR). Myinmu, on the northern bank of the River Irrawaddy, where it turns south to meet the Chindwin, became the main front of 20th Indian Infantry Division. In one of the decisive battles on the Irrawaddy, the Division aimed to establish a bridgehead before forcing a crossing of the river and breaking through to the Mandalay road. Myinmu was occupied after a sharp engagement in which the enemy lost heavily in stores and equipment and during the siege they made several desperate attempts to escape across the river. On one moonlit night, the Gurkhas watched as 24 Japanese soldiers all jumped into the water. Weighed down by weapons and equipment, they perished one after the other. In the first critical days after the establishment of a western bridgehead, Horsford’s men had to cross and recross the river three times under heavy shellfire and resist many determined counter-attacks by the Japanese. During the difficult operation to relieve the garrison, he was given the task of attacking strongly held enemy positions thus drawing all the enemy reserves and shelling upon himself. lliot Thomond Horsford was born at Lingfield, Surrey, on June 5 1921 and educated at Clifton College. Known to his Army comrades as “Slim,” he attended the short course at RMC Sandhurst and, after being commissioned in 1939, he was posted to 2nd Battalion 8th Gurkha Rifles at Shillong, India. A transfer to the newly formed 3rd Bn (3/8 GR) was followed by a spell as an instructor at OTS, Bangalore, and then, in 1943, he accompanied the battalion to Ranchi, India, and from there to the Kabaw Valley, in Burma. In April, during the pursuit southwards from Taungdwingyi, he again distinguished himself when his company surprised a column of the enemy in the small hours of the morning. They killed 13 and wounded 30 . When his CO was killed and the second-in-command was wounded, he commanded 3/8 GR until the end of the campaign in Burma. In November 1947, after Independence, Horsford transferred to 2nd King Edward VII’s Own Gurkha Rifles (The Sirmoor Rifles) (2 GR) in Malaya at the beginning of the “Emergency.” Three years of operations against the Chinese Communists were followed by a move to Lehra on India’s border with Nepal where he was involved in recruiting. A staff appointment with 17 Gurkha Division was followed by a return to regimental duties with 2/2 GR and from 1960 to 1963 he commanded 2nd Bn 6th Queen Elizabeth’s Own Gurkha Rifles . After a spell as Brigade of Gurkhas Liaison Officer at the MOD and a year at the Nato Defence College, Paris, he moved to Oslo as a member of the Nato staff (1966-69). 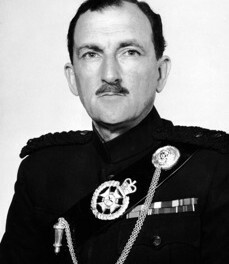 Horsford retired from the Army in 1969 and served as Assistant Defence Secretary in the Sultanate of Oman from 1970 to 1973. For the next 13 years, he was Assistant General Secretary of the Royal UK Beneficent Association. He was appointed MBE in 1956. In retirement, he enjoyed golf and watching cricket . He married first, in 1953, Averil Tarrant (née Inglis), who predeceased him. He married secondly, in 1996, Carole Hendey who survives him with two sons of his first marriage and two stepsons.